The site is part of a large (1600ha) National Nature Reserve and Site of Special Scientific Interest(SSSI) and is home to the satellite dishes of British Telecommunication’s iconic Satellite Earth Station, which received the first transatlantic television signals. It is one of the finest examples of heath land in the UK and contains significant archaeological remains. Goonhilly Downs is archaeologically significant for its large concentration of Early Bronze Age (c2500 to 1500 BC) round barrows. The Dry Tree menhir (standing stone) forms part of a well preserved ancient ceremonial landscape at Dry Tree, which is the highest point of the Downs. The standing stone, which had been toppled in antiquity, was only re-erected in 1928. There is also a large barrow, named in an Anglo-Saxon charter as cruc drænoc or ‘barrow at thorns’, which marks the meeting point of five parish boundaries, and is also a waymark along an important medieval trackway. The Earth Station is built on part of the site of a WW2 Chain Home radar station, RAF Dry Tree, and the concrete bases of the radar receiver and transmitter masts and mast stays are scattered over the site, as well as the remnants of over 50 buildings and more than a hundred anti-landing obstructions. The nearby area housed another three radar bases (Treleaver, Trelanvean and Pen Olver) and an airfield at RAF Predannack, making for a wealth of WW2 archaeology. The ‘Happidrome’ was a nickname for a specific type of radar building (like this one at RAF Patrington in Yorkshire). It was located at RAF Treleaver, not on the Drytree site. The building was named after a popular BBC radio series of the era. 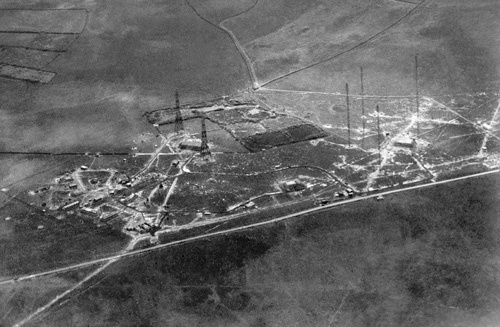 As well as the visible remains of RAF Drytree, some of the site was subsumed by the Goonhilly Satellite Earth Station, one of the first three satellite stations in the world. It was from here, in 1962, that the first live transatlantic television picture was transmitted to America from Antenna No. 1. This Antenna, now christened Arthur, has recently been given Grade II Listed Building status. With thanks to Historic Environment Service at Cornwall County Council. Photos copyright BT Heritage unless stated.